Even if you don’t know the symbolism behind Carter Hodgkin’s watercolor paintings, you can sense its controlled chaos. Thousands of colored dots appear to spray out from a concentrated area of dots—a core, if you will—in curved and straight lines, creating the sense of a never-ending surge of… something. When I first saw her work, it reminded me of a star exploding, little pieces of it jettisoning through space. As it turns out, that wasn’t far off from Carter’s inspiration. 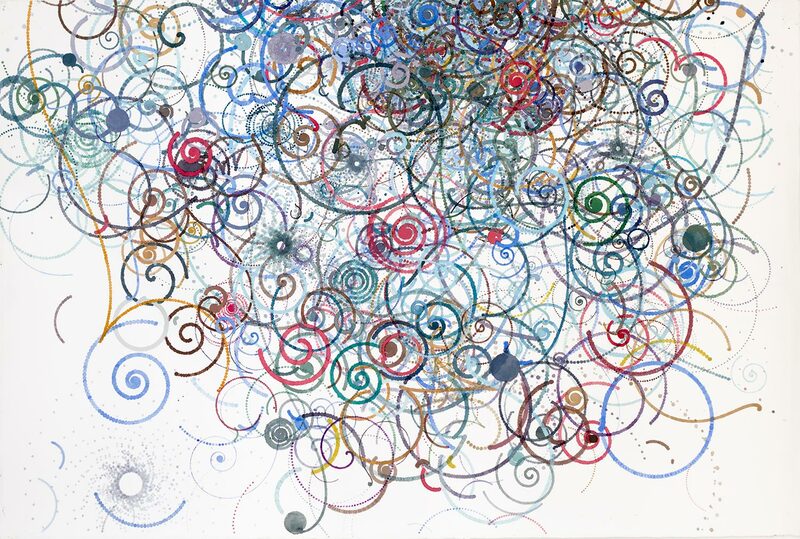 Carter’s paintings are a visualization of the movement particles make when they explode—in other words, energy. She uses a computer program called Processing to design the layout of the image, then prints a faded version of the design and paints over that. She works mostly in watercolor, but started translating her work into animation in 2009. In the past eight years, she also designed two large-scale mosaic murals, using thousands of tiny colored glass tiles to build the images. The art of mosaic dates back to the third millennium BC, long before the computer programs that Carter uses to design and build hers existed. But this intersection between the ancient and the future is part of what fascinates Carter, who studied anthropology in college in addition to painting and printmaking. Login or signup to read this story. Purchase an annual membership for just $10 and get exclusive access to back issues.